1 Dozen .32 Cal. Pistol bore brushes packaged in a zip closure bag. When a Pro-Shot brush is half worn out, its as good as most other major brands brush brand new! Here's why, our specifically designed bore brush for each Cal./mm brush is sized to make cleaning faster & easier and aid in extended brush life. 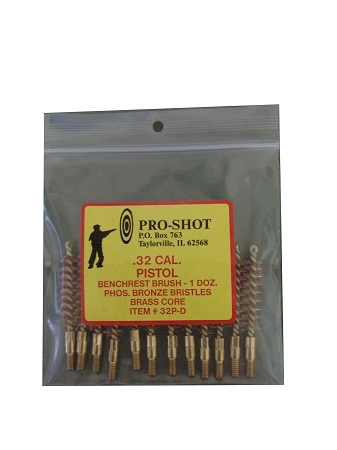 Brass Core and Bronze Bristles (Benchrest Type)designed for competition shooters to withstand frequent use.Construction consists of a high quality brass core and coupling with bronze bristles. Pro-Shot’s Benchrest Quality Brush has been used for many years with several world records to its credit. This bore brush is exceptional for bore cleaning with superior cleaning ability and it will not harm the bore.